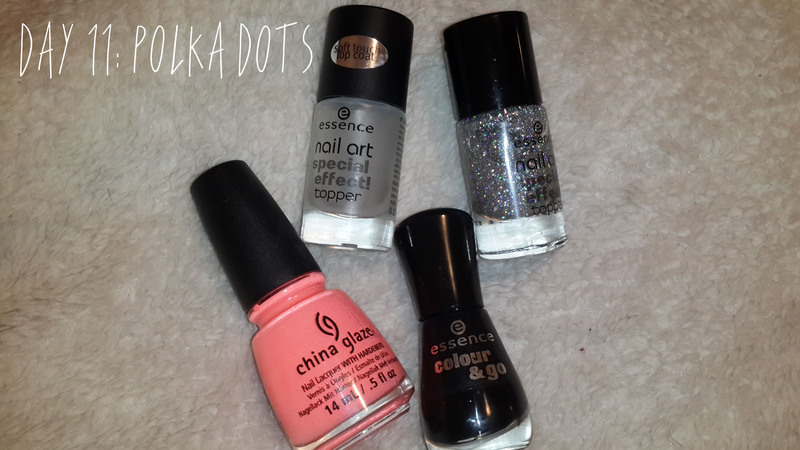 So here is the final post from the 31 Day Nail Art Challenge. I was seriously questioning my sanity the last few days. The challenge is tough, it really tests your creativity and skill. Ok so we were supposed to honor nails we loved. 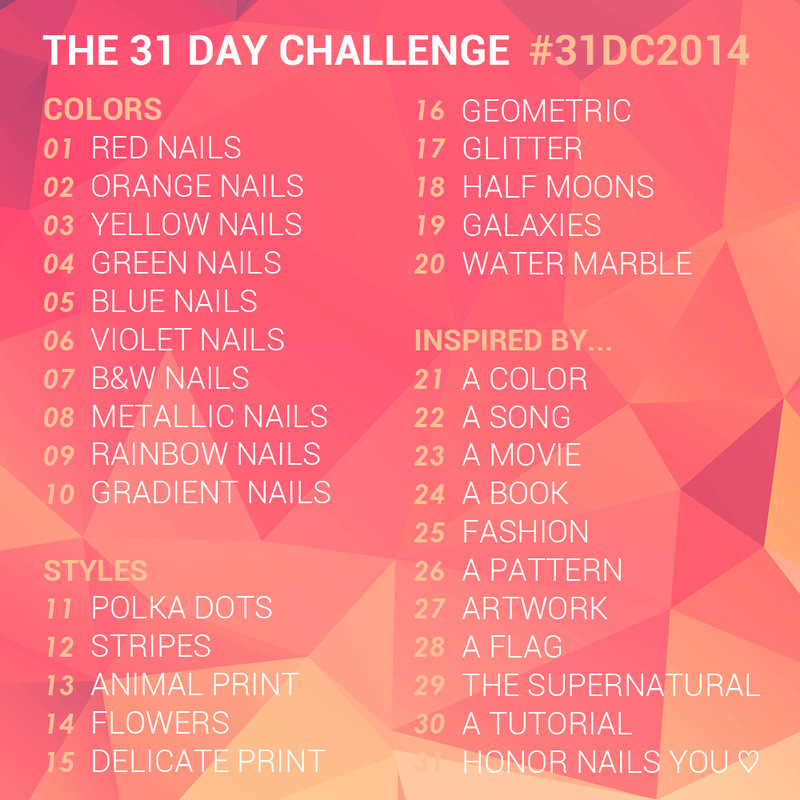 I was inspired by Paulina’s Passions, this was actually the Nail Art she did for day 12 of the challenge. Essence “A Piece of Forever” from the Twilight Breaking Dawn Trend Edition. 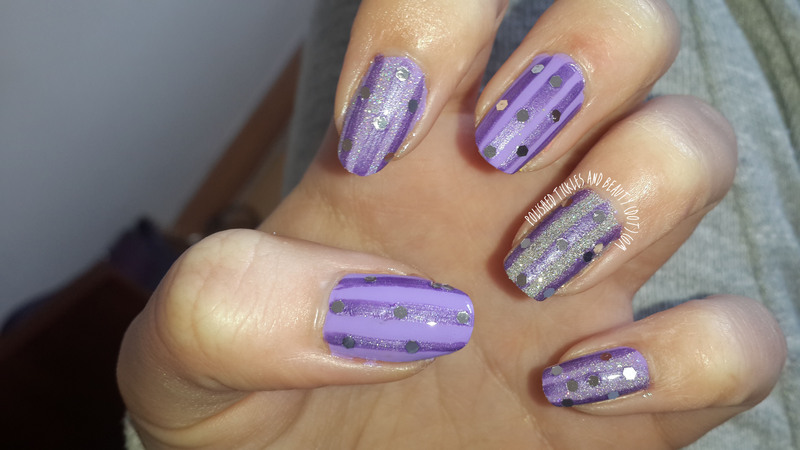 I also used Studs that I bought from Maskscara (A nail Supply store in Cape Town) and my striping tape from ebay. So I really had fun doing this. I really like it 😀 but need to practice painting anchors. Yipeee its over hehe, will do it all again next year for sure! Great test of skill & creativity. Sorry about the delay with this post. I was most annoyed. Today is inspired by a Book. I tried to decide on a book to use but couldn’t. 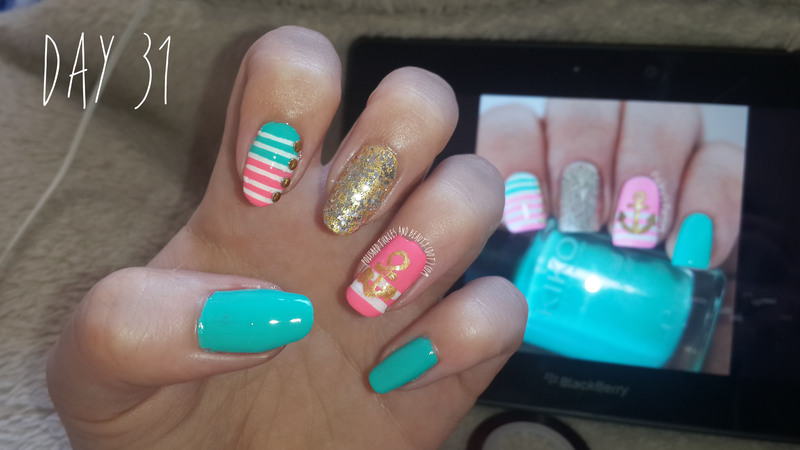 I had been playing with the Idea of scrapbook nails a while back but never thought much of it. 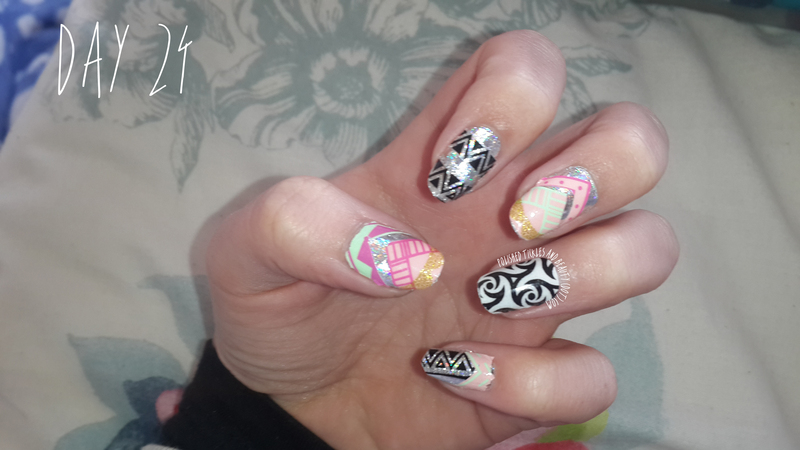 The concept of scrapbook nails is to take nail stickers and create something different. 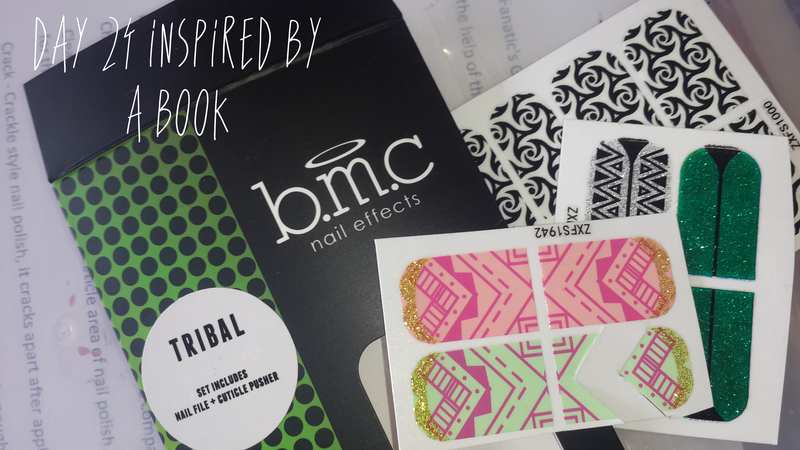 Bundle Monster Nail Effects Tribal. There was absolutely no polish used to make this mani. 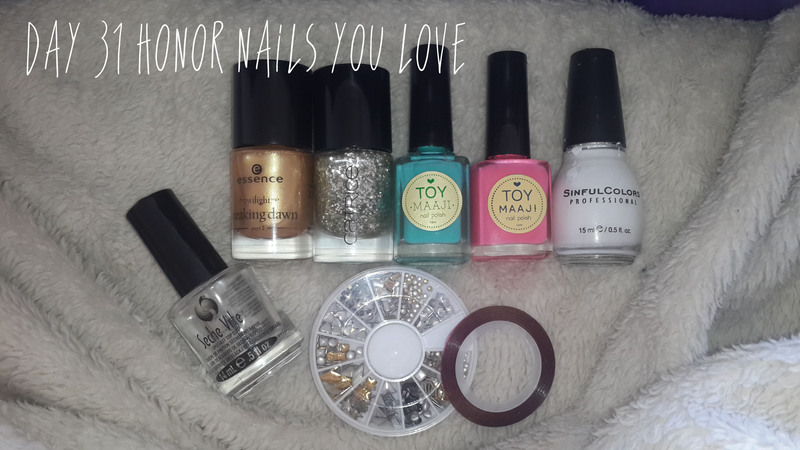 The base of my nail art was a really old no name brand (I threw the cover away years ago) nail sticker in a holo silver. Overall I thought it looked pretty but I think the idea needs some refining. What do you think? 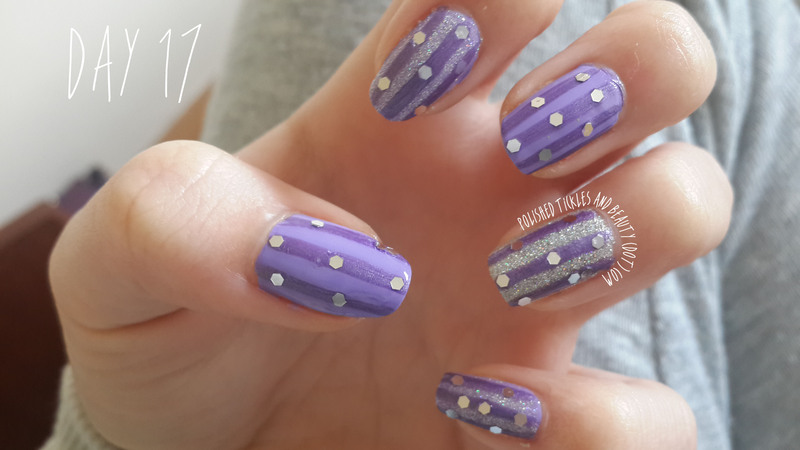 Great way to use nail stickers? 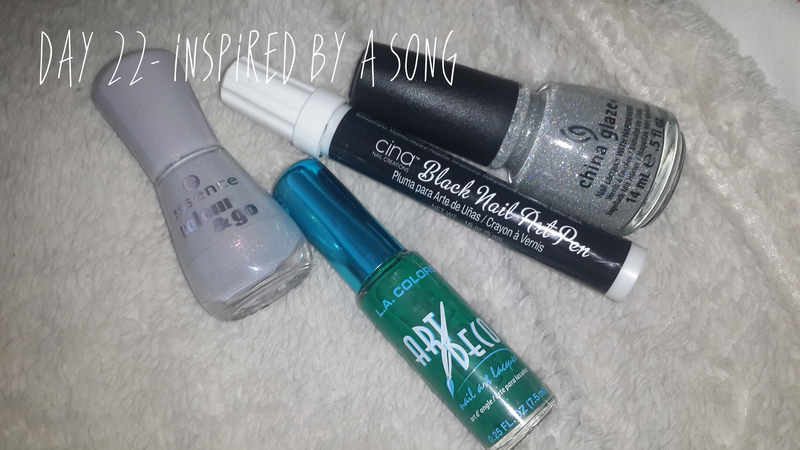 Today is Inspired by a Song… I thought about it for a whole of 5 seconds and I knew exactly what song I wanted. Its sort of a depro song but man is it stunning! Its called “Black Roses” sung by Claire Bowen aka Scarlett O’Conner from Nashville (The TV Series). 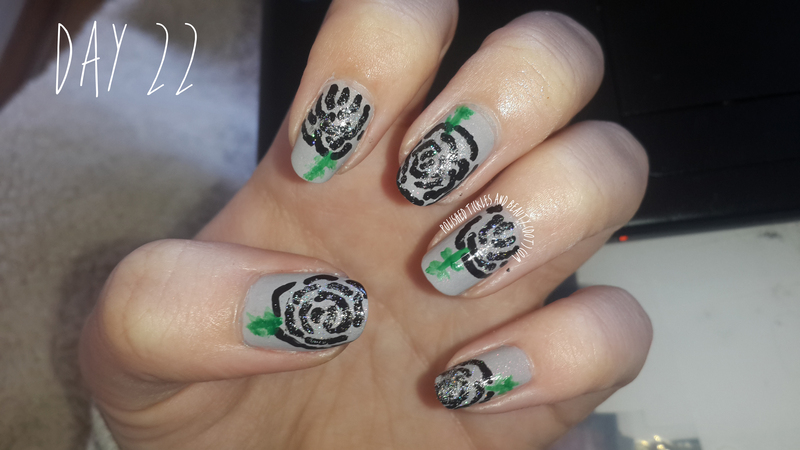 I’m not so great at painting roses, so I just drew them. Today is Galaxies. Woopeee hehe, I love doing these, no matter if you think you messed it up it just always works out! 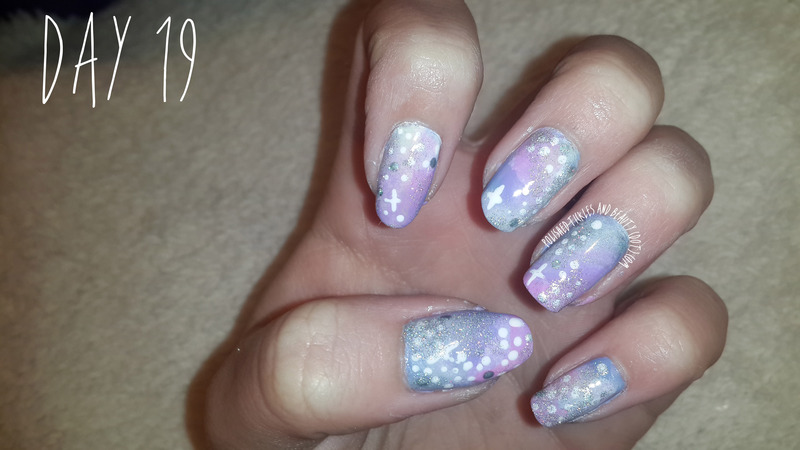 I have done a few Galaxy Mani’s see here & here. And I have wanted to do a pastel galaxy mani for ever! Everything was just sponged on at random over the white sponging. I used “Absolutely Blue” as the base colour. It was loads of fun! And absolutely my Fav one ever!!! 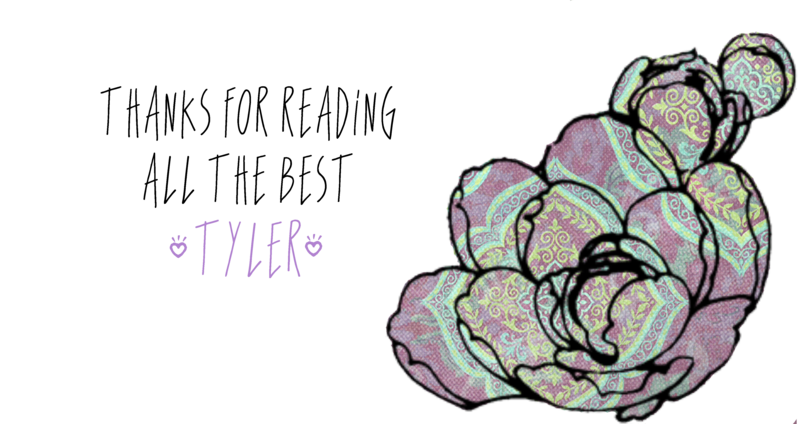 We are almost at the end of the Styles section. I normally manage to get this far, I struggle when it comes to the “Inspired by” section. Eeek its so close. This challenge is starting to get tough, its difficult to be inspired every single day. But I am going to trudge on and finish this challenge! Today we are basically half way. 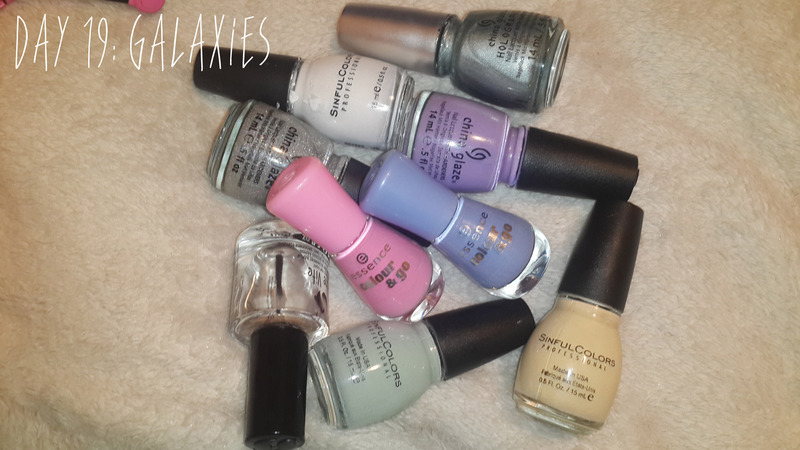 I have only recently got my hands on Sally Hansen polishes, My 2nd Mom Mandy bought me a couple. They actually stamp brilliantly! 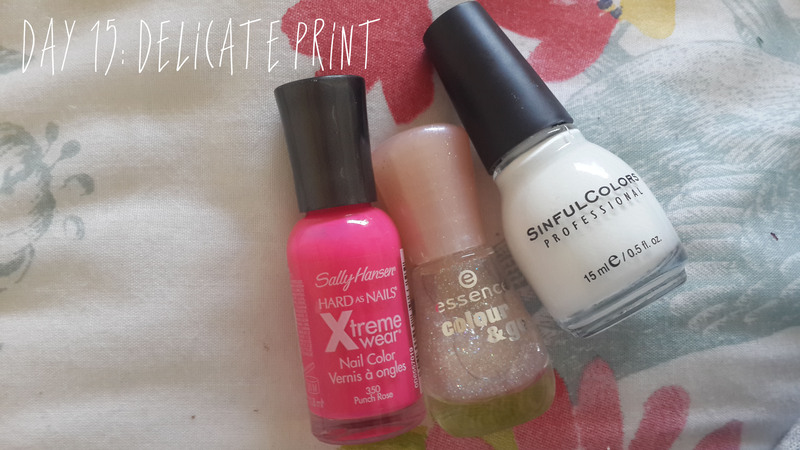 I love the look of it, the white base makes the pink pop off my nails. I added some of the Essence glitter over the top and tah-dah! I chose “Space Queen” because it is so light it wouldn’t get in the way but give a subtle sparkle. I have more dotting tools than I do nailart brushes… I have a spare set just in case I loose one. 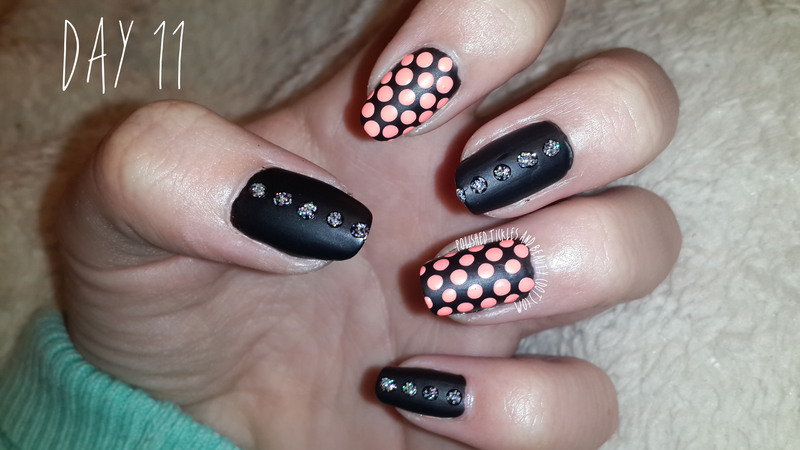 I started with a base of “Black is Back” and then added 2 coats of “Soft Touch”. Then I dotted on some holo and neon dots and Tah-Dah! What do you think? 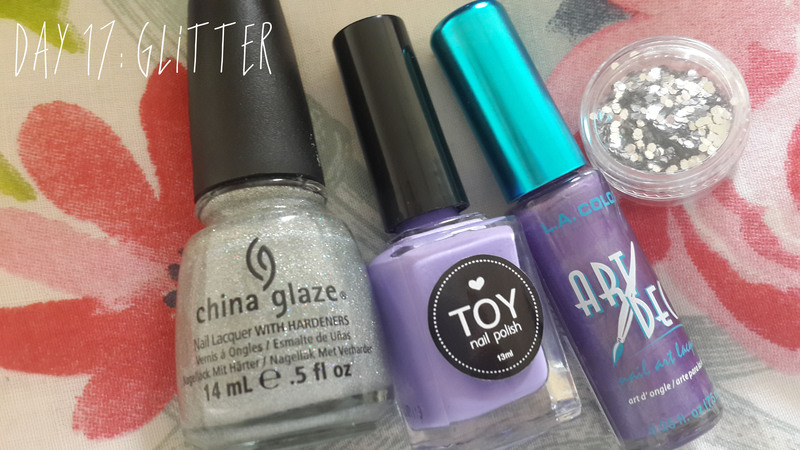 This mani is super easy to do.